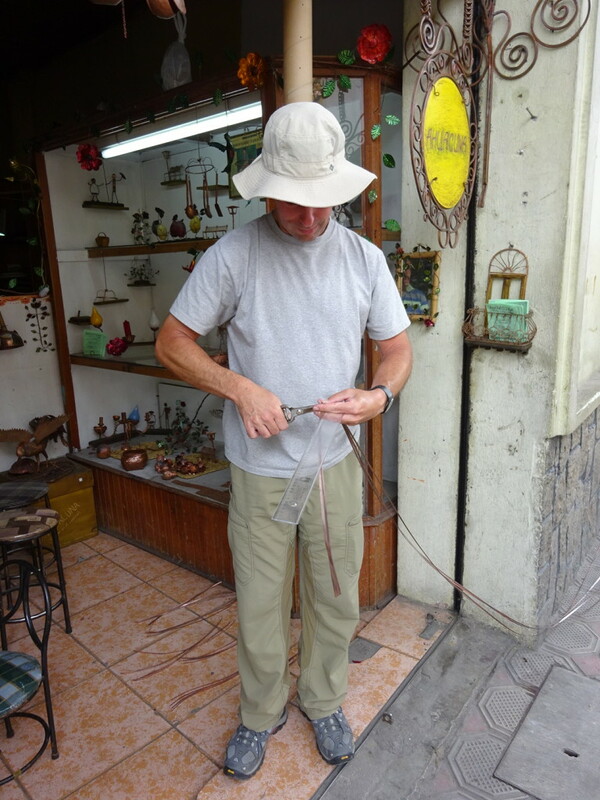 Posted on January 29, 2015 by No Map Required Posted in Art, Art & Engineering, Ecuador, Places	. 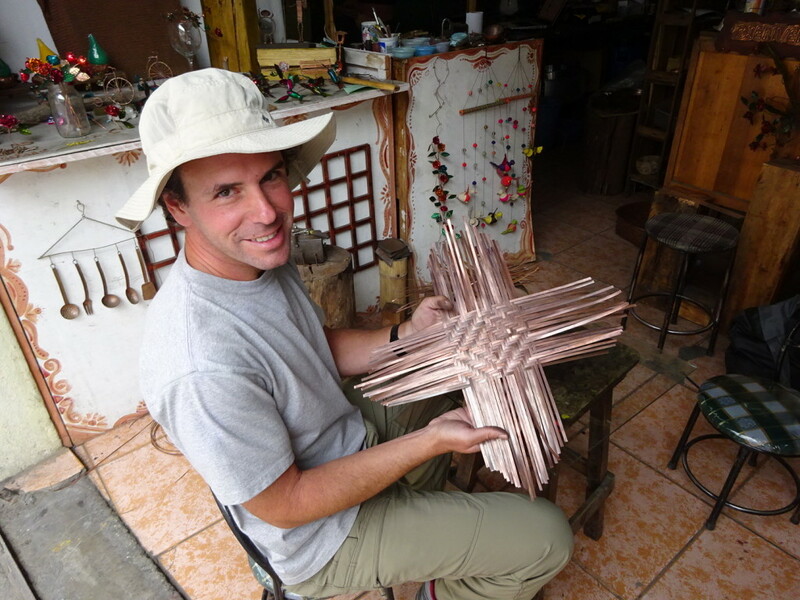 Perhaps you remember Marco Machado, the Cuencan coppersmith, from our earlier post? If so, you won’t be surprised when I tell you that I jumped at the chance to go back and spend the day learning from him! 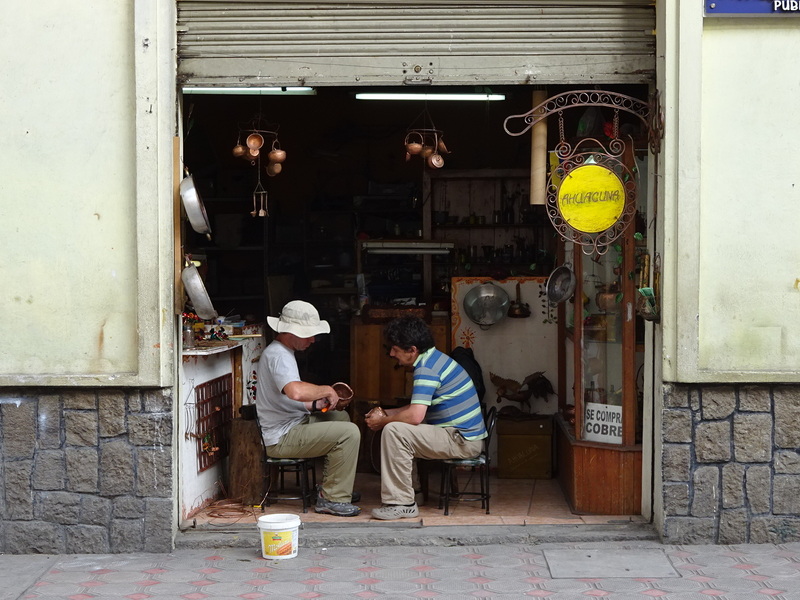 When we first met him, he was kind enough to offer to teach me and I finally had a chance to take him up on it the day before we left Cuenca. Boy am I glad I did! 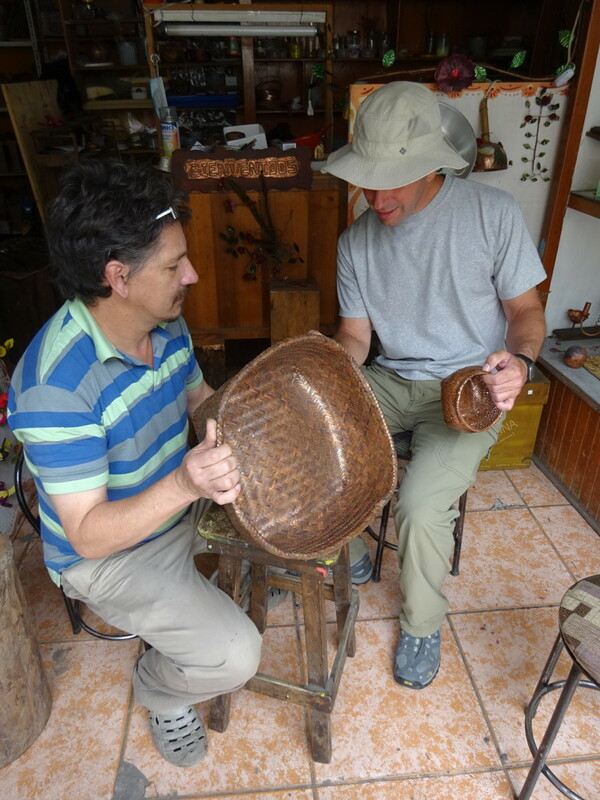 Working with Marco on our baskets on a fine, sunny, Cuencan afternoon! 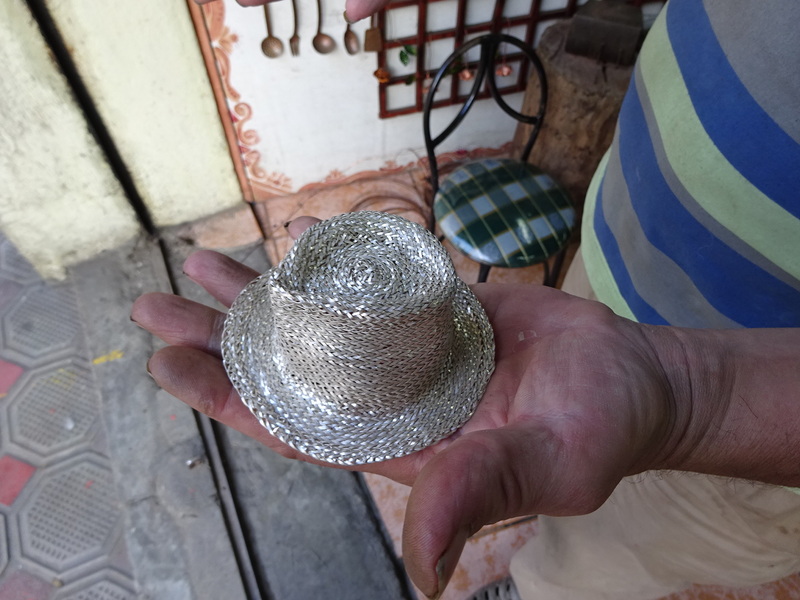 Marco comes from a family of artisans: his grandfather was a jeweler, his father was a jeweler, his mother works with textiles…art is part of what defines his family! After exploring jewelry and learning traditional weaving arts (he weaves the same toquilla fibers used in making Panama hats along with weaving metal), he moved into working with recycled copper about 5 years ago…and his son, David, has followed him into the business. 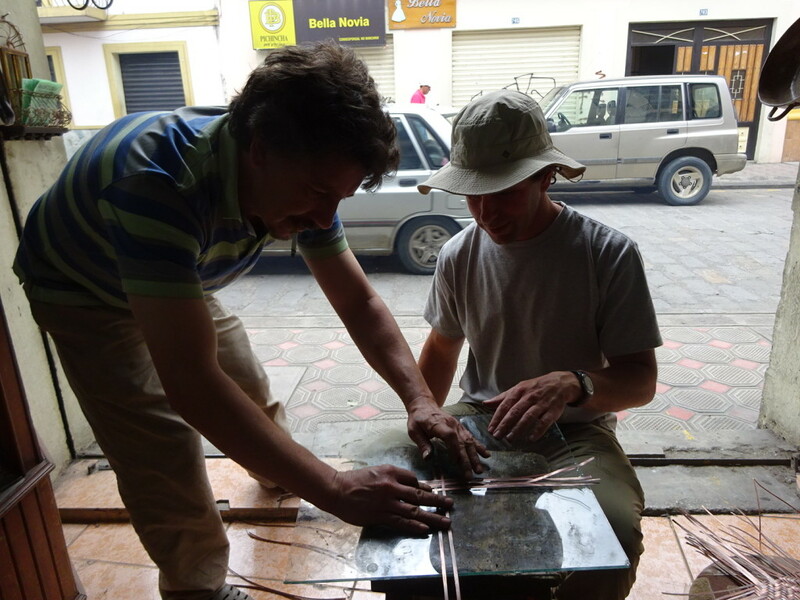 In fact, when I showed up for my lesson, David was also there working on some maquettes (models) in copper as a commission for a local architecture student – very cool, artsy frame designs. 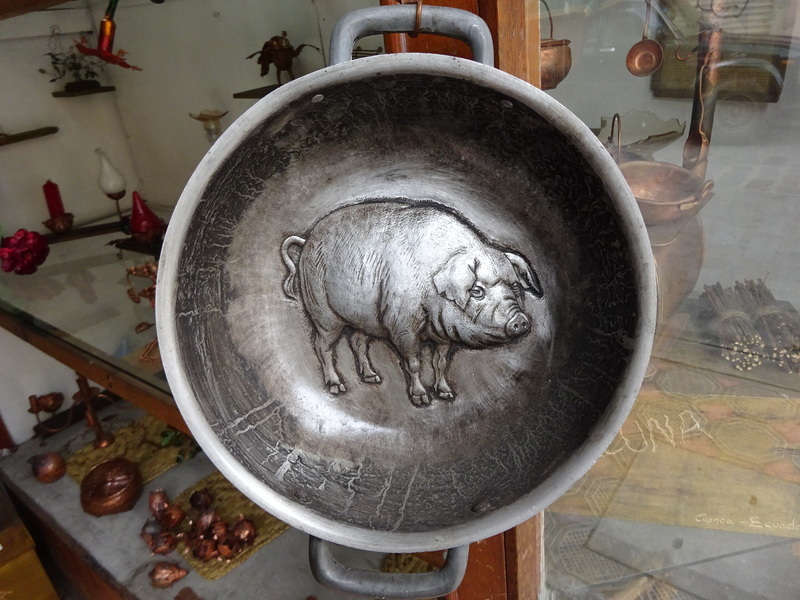 Chased pig on a serving/cooking pot. fabrication, soldering, hollow forming, chain mail and metal weaving among other things! 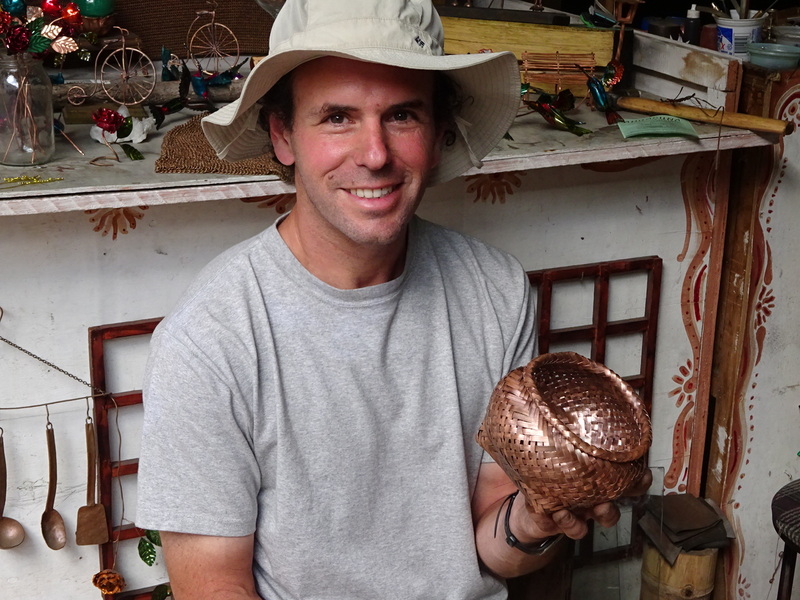 Marco works in silver as well as copper. Great hat, eh? 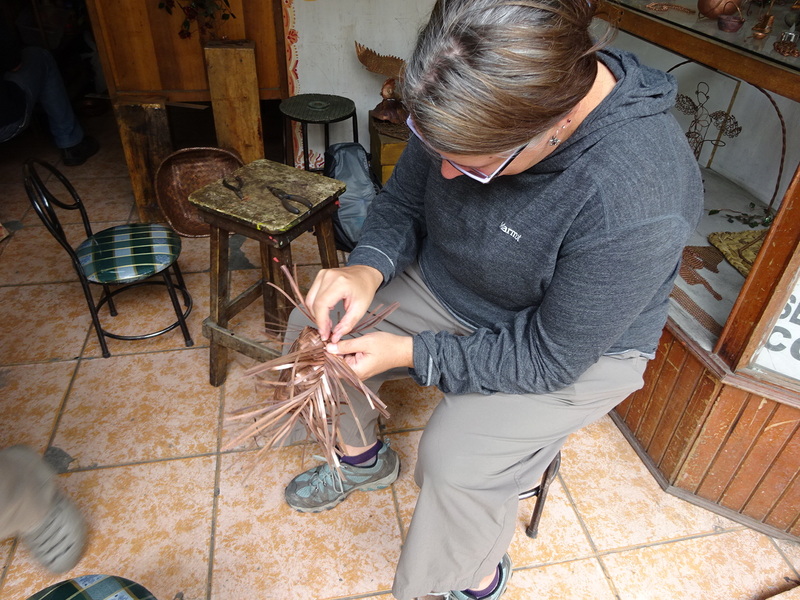 Luckily I had been thinking about it and the piece that had most fascinated me when I was first in was a woven copper basket. So, weaving it was! This was the big basket that inspired me…but the size in my hand seemed a bit more reasonable! I hadn’t realized, but they are multiple types of weaving. 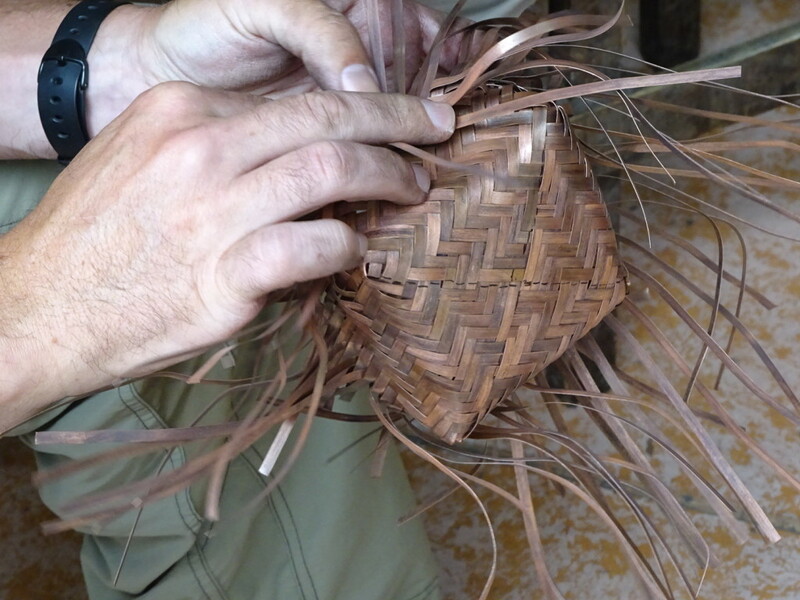 The main differences for me related to whether to use flat (“laminate”) or round wire and what pattern to weave. Flat all the way and a traditional pattern, please! 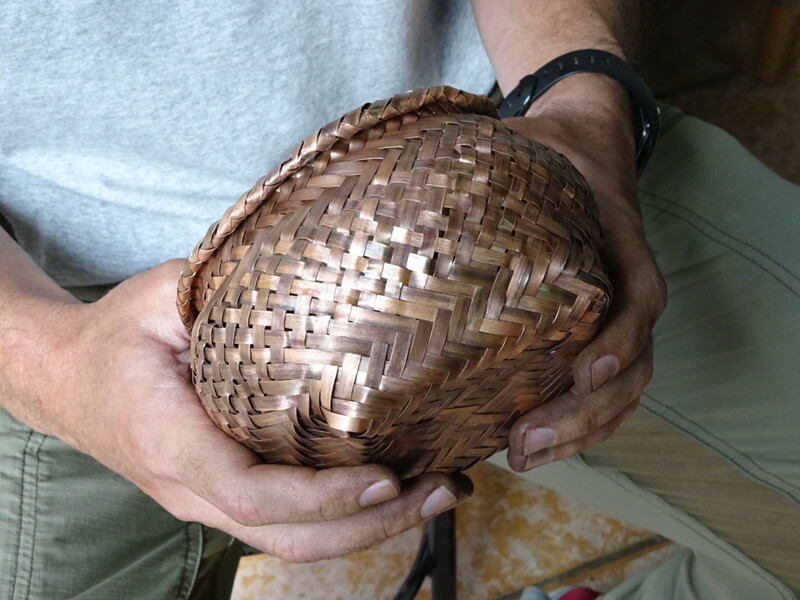 Marco is the only weaver of copper using the flat/laminate style in the country and possibly, if he’s right, on the entire continent. His work reminds me a bit of an artist I hosted as part of the Seattle Metals Guild Lecture Series last year, Arunas Oslapas, though Marco is much more traditional textile pattern oriented. For those who are interested, we took a BUNCH of short videos of the process and they are all on our youTube page. They uploaded out of order, but I numbered them, so hopefully you can follow along. Before we could get started, we needed to get a bunch of flat wire for us to work with. 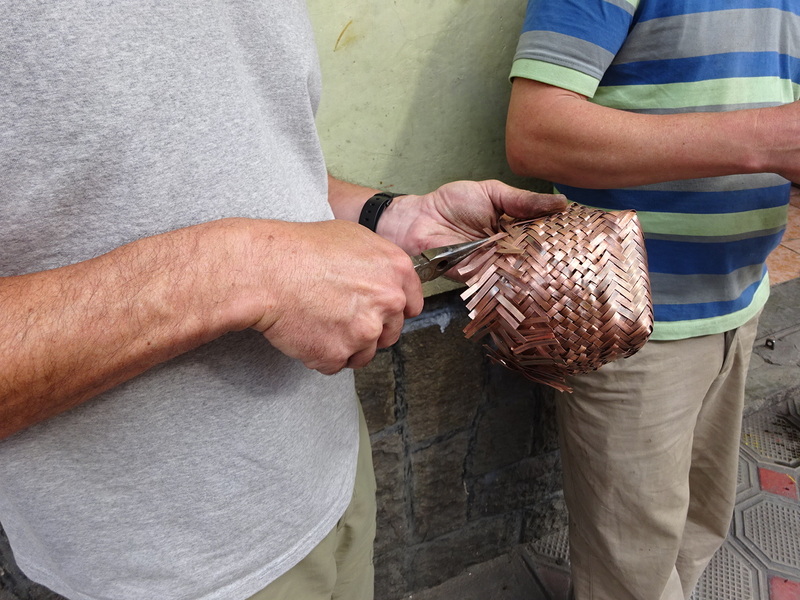 Since everything Marco does uses recycled copper, that meant annealing some old wire and then taking it off to another building for rolling flat. Marco has a GREAT sense of humor and he loved having Anner help out with the rolling – you can see her in action in the Step 3 video especially. The machine you see there is a motorized rolling mill; great for flattening large amounts of wire. It cost $900, but with flattened copper wire running $20/kg, it pays for itself pretty quickly! 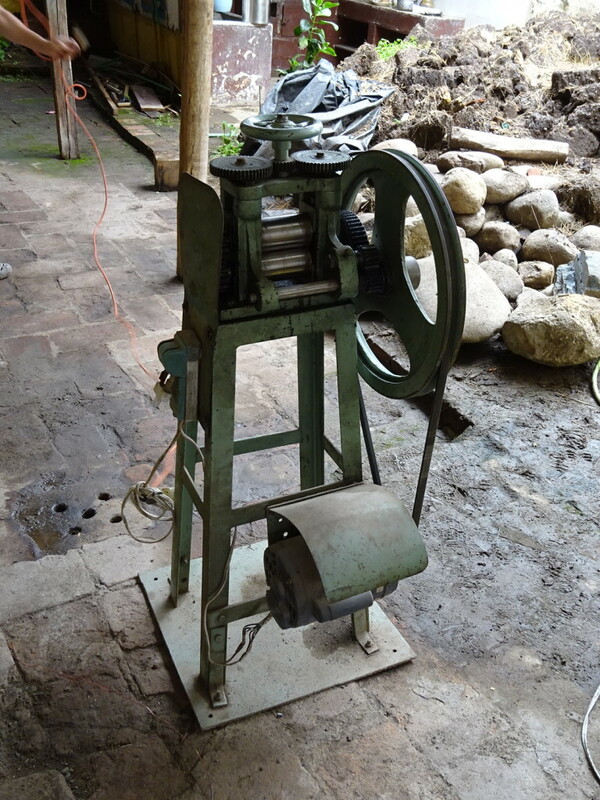 The motorized rolling mill. Roll, baby, roll! First I had to cut 13 sets of strips from the wire we had flattened. The wire trailing off went down the block! Strips on the floor, each had to be marked at the halfway point and then weaving could begin! 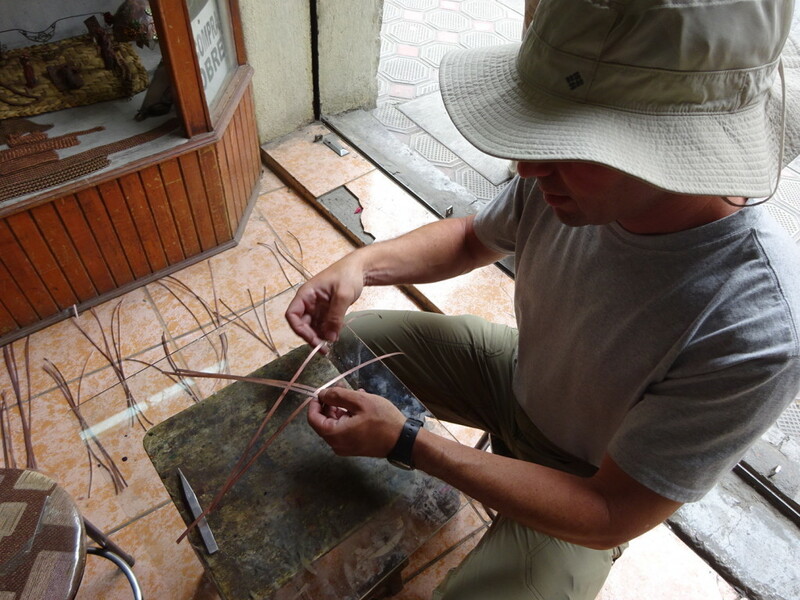 Marco showing me the base pattern…I had a lot of trouble with it. Guess that comes from having no weaving background? 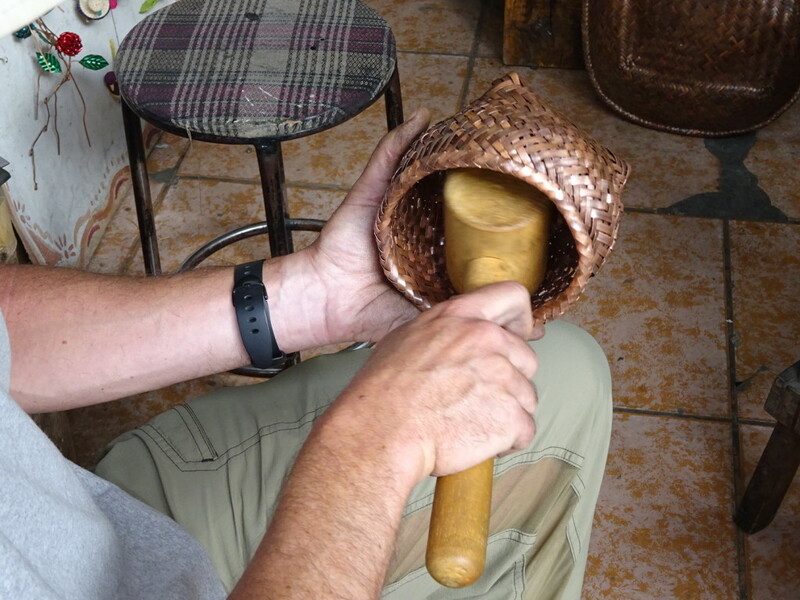 Bend up the sides and keep on weaving! You can see the black marks on the bottom which I had originally made as center-lines. You can also see the spaghetti that had me often confused as I tried to follow the pattern! Anner added her special touch on the middle section. 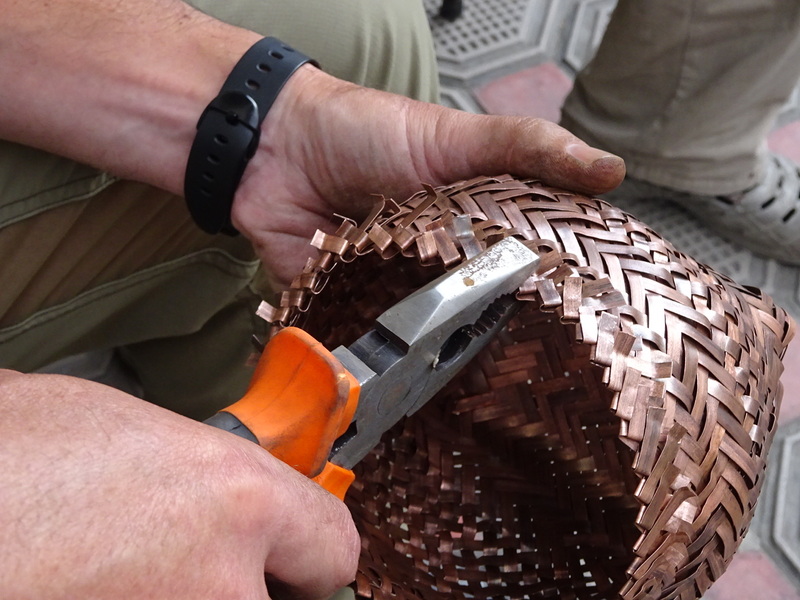 …and just like that, a basket is born!!!! 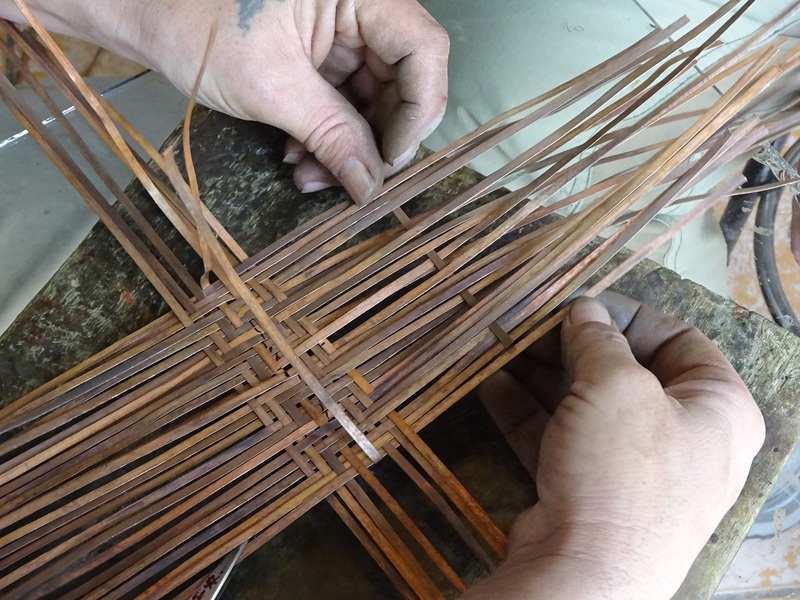 And speaking of hands, this weaving of copper is quite the dirty business! 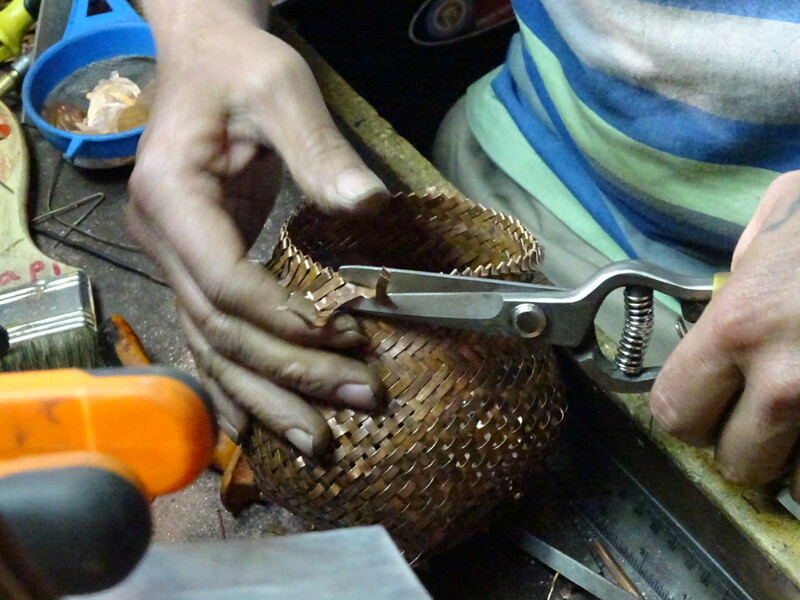 Makes you appreciate the basket even more when it’s done. Pretty darned special to learn directly at the hands of a master! I’ve got a LOOOOONG way to go to get my baskets to compare with his, but it was truly a magical afternoon! If you ever find yourself in Cuenca, I hope you’ll do yourself the favor of stopping by and saying hi to Marco (“Ahuacuna” on Facebook, shop in Cuenca on Juan Montalvo and Sucre). Go see Marco – you’ll be glad you did! Oh, it’ll be headed home eventually! Our housesit host has offered to get it sent when her family visits and then returns to Canada – much safer to send from there than from Ecuador. Quite a lovely result. 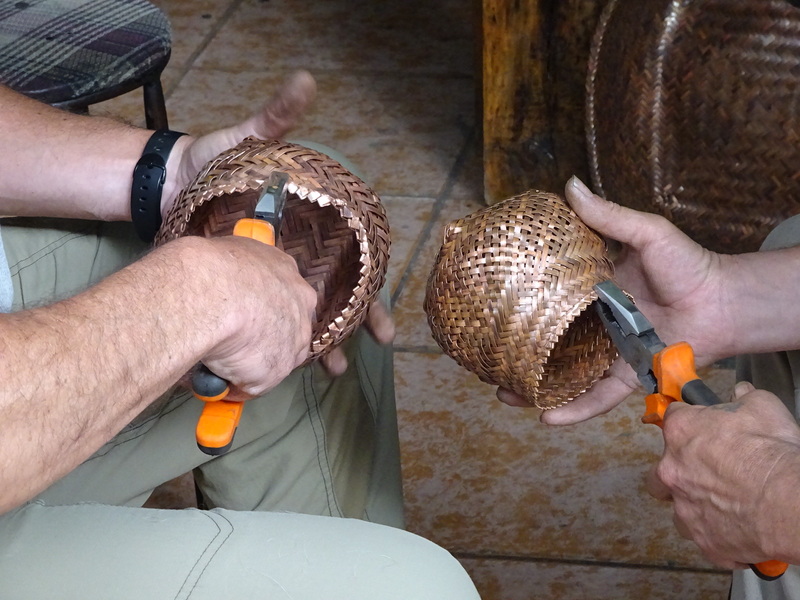 Now you can practice weaving. with grass and reed baskets, (or a new backpack) like native Americans anywhere you are. Practice, yes, succeed…maybe not. 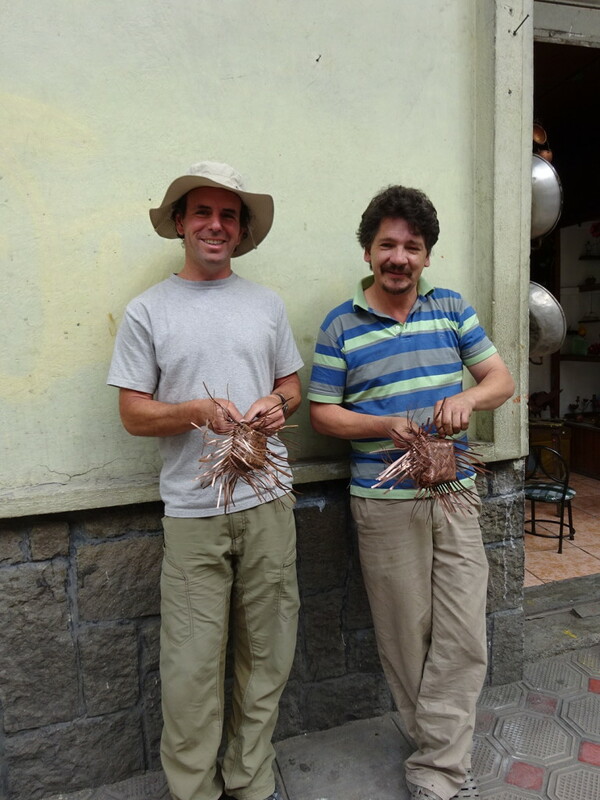 But perhaps you’ll find us in a mercado with our wares some day soon. Or perhaps not! Beautiful basket. I can’t believe it’s your first! I’d love to see more of the chasing and repousse. Do you think Marco would share more pictures? Happy travels! Thanks, Megan! 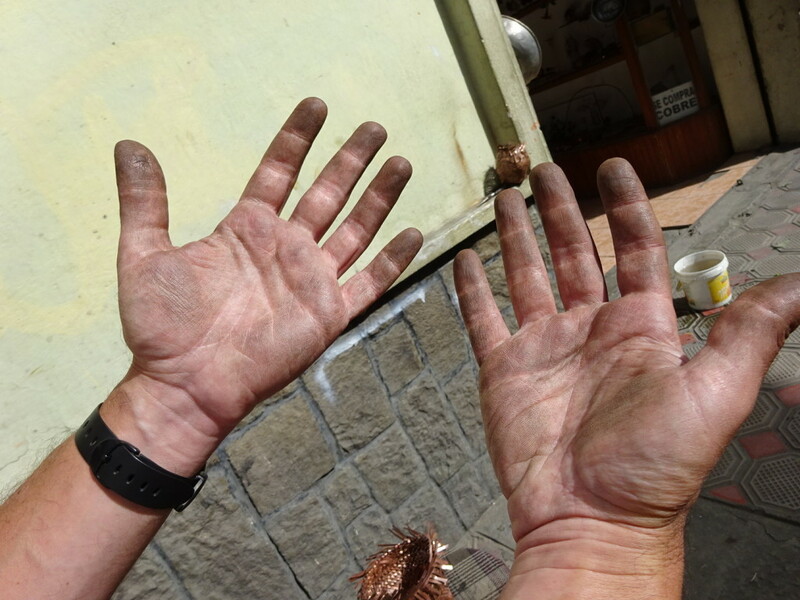 It definitely helped that Marco was right there working on his own next to me and guiding my hands when needed! Ah, now, I hope you promised SMG that you would teach workshops on all the techniques you try on this trip! Probably not a workshop, but maybe a Lecture Series talk! So far it’s been more observing than practicing, so a talk would be muuuuch better. Am on my way to Cuenca. Do you have his address as I would love to visit and see his shop. Hi Jo! I believe the address is Juan Montalvo 7-86 and Sucre. That’s according to the Instagram feed for his son who works for him. Hopefully Marco will be there – say Hi for us and have a wonderful visit to Cuenca!